← Blog to Book Networks: The New Book Publishers? Over time, book production has become more “virtualized.” Every step in the development process has now evolved to the exchange and processing of digital information. But after development, the moment of truth arrives. How many books to print? 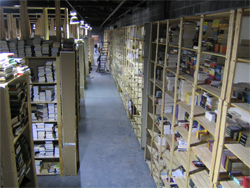 The spectre of physical inventory has always loomed large over the publishing industry. Physical inventory is the biggest threat to a publisher’s profitability. And with the uncertainty about returns from booksellers, even when you ship it out, a substantial portion of it may come back (estimated to be on average about 30+%). But what if no inventory was created until the point of sale – and every sale was final? Publishing Nirvana. Print on demand publishing has particularly helped small publishers avoid the inventory trap. But the Book Espresso Machine (see picture at right) from onDemandBooks may bring Nirvana another step closer. 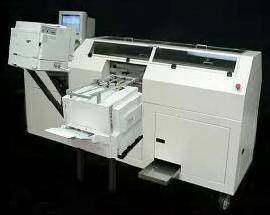 Book ATM – select your book, insert your card and the book is printed in a few minutes. One hour non-book retail service – Drop off your book request (author / title or ISBN) at a department store, drugstore or drive-up standalone book printer, and pick up the freshly printed book within the hour. Bricks and mortar retail bookstore with infinite shelf space – Walk into your favorite bookstore and no matter what title you want, it can be ready for you in a few minutes. No waiting or paying for deliery and those nasty shipping / handling charges. Online bookseller networks – Amazon and Barenes & Noble Online create their own networks of book ATMs. They offer the great search and recommendation services, but carry no physcial inventory of finished books. Please let me know how much one machine costs and the cost of upkeep, etc. I work in a library and wonder if our library or Friends of the library could offer such a service. EBM is a amasing invention. I`an realy interested in more info about a machine. If there is an representative for Portugal pleale let me know.